While the SMP community still exists and is active, the summer program no longer runs due to lack of funding. 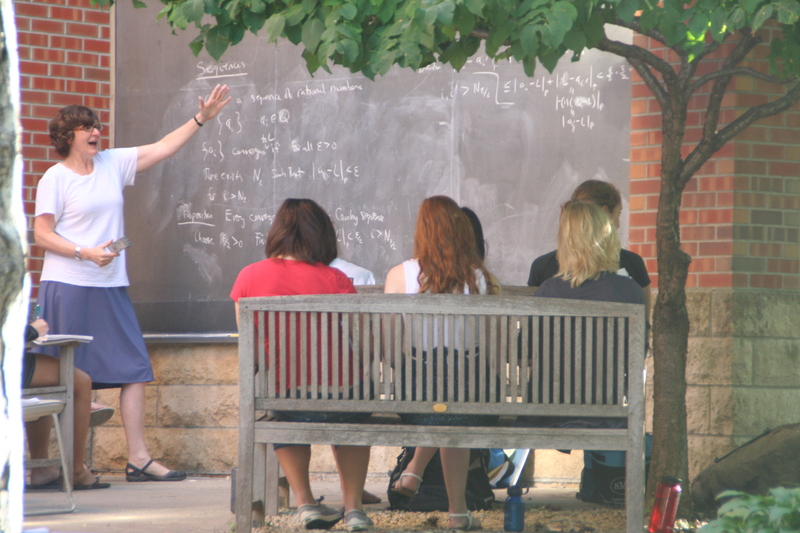 The Carleton College Summer Mathematics Program for Women is an NSF-funded program to encourage and support women in their study of mathematics. connecting students into a supportive network of other female college math majors, graduates and professionals to support them through their graduate studies in mathematics. Admission into this program is highly selective and is limited to female mathematics students who are currently completing their first or second year of college. Students are expected to have had Calculus and Linear Algebra. Participants must be U.S. citizens, nationals, or permanent residents. "This experience has revived my mathematical soul and charged me up." "The program has given me the confidence that I can succeed in math, both as a student and as a woman." "I feel like a future in math was opened for me through the program." "My confidence, interest and goals in mathematics soared to new heights with the information presented to me through the program." Program directors: Deanna Haunsperger, Steve Kennedy, Laura Chihara, Gail Nelson, and Jill Dietz. Poster for the 2014 program. Information about the 2014 program. Information about applying here; the deadline is February 14th, 2014. "A Serendipitous Sisterhood" in MAA's Math Horizons, September 2007. "Serendipity and Inadvertence in the Building of Community" in Building Intellectual Community Through Collaboration, Carol Rutz and Mary Savina, Editors, 2007. "Strength in Numbers" in MAA's FOCUS, February 2001, pp 4-5. "Carleton and St. Olaf Colleges' Summer Mathematics Program" in AMS's Proceedings of the Conference on Summer Undergraduate Mathematics Research Programs, Joseph Gallian, Editor, 2000. "Carleton and St. Olaf Colleges' Summer Mathematics Program" in MAA's Women in Mathmematics: Scaling the Heights, Deborah Nolan, Editor, 1997. "Summer Mathematics Program for Women" in AWM's Newsletter, 1996. The program is being held on the Carleton College campus in Northfield, Minnesota, which is located approximately forty miles south of Minneapolis.